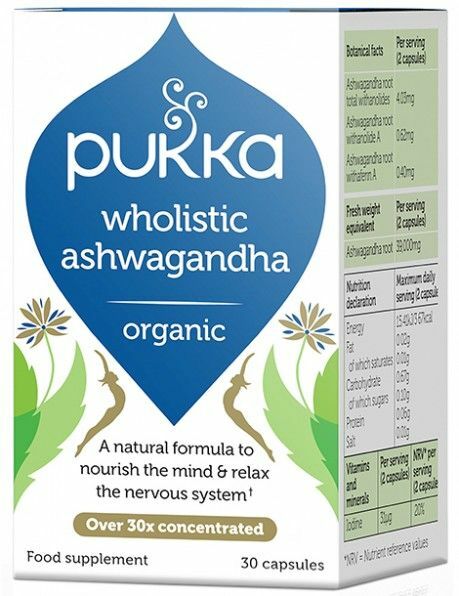 With a wide variety of health benefits Ashwagandha is an uplifting herb with plenty of research to back its Ayurvedic properties. This blend includes iodine which helps to calm the nervous system and worried mind. In soil conditions where other plants would fail to thrive, the Ashwagandha plant flourishes and develops its rejuvenating potency. Pukks Wholistic Ashwagandha is made using only the most sustainably cultivated, highest grade organic root, so that you enjoy the full benefits of these health-boosting capsules every day. It is known for its immune boosting and strong adaptogenic properties. This blend helps reduce stress by calming the nervous system. Take 1–2 capsules a day with water before food. Seek professional advice during pregnancy. Do not exceed the recommended daily intake. Do not use this product as a substitute for a varied diet.